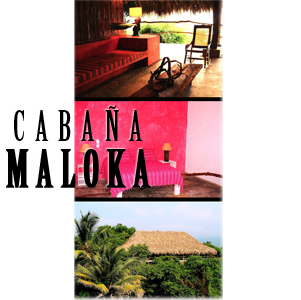 Maloka Cabin is a recently built cabin in Finca Barlovento. It offers 6 rooms with private bathrooms, five of them with a queen size bed and one with two double beds. Three cabins have views of the forest where you can watch the flora and fauna as birds, micos, etc..., and the other one offers views of the sea. There is also a living-room and a terrace. Capacity up to 3 persons per room. All rooms have protection against mosquitos. Breakfast and dinner are included in the package. Lunch on demand. Dinner is served until 19:30h.